IBPS House, Post Box No.8587, Kandtvall (E), Mumbal 400101. 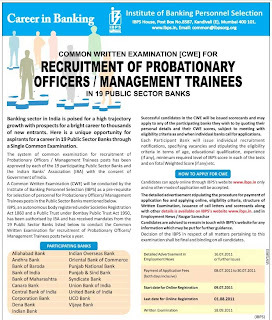 Common Written Examination [CWE] For Recruitment of Probationary officers / Management Trainees in 19 Public Sector Banks. The system of common examination for recruitment of Probationary officers / Management Trainees posts has been approved by each of the 19 participating Public Sector Banks and the Indian Banks' Association (IBA) with the consent of Government of India. 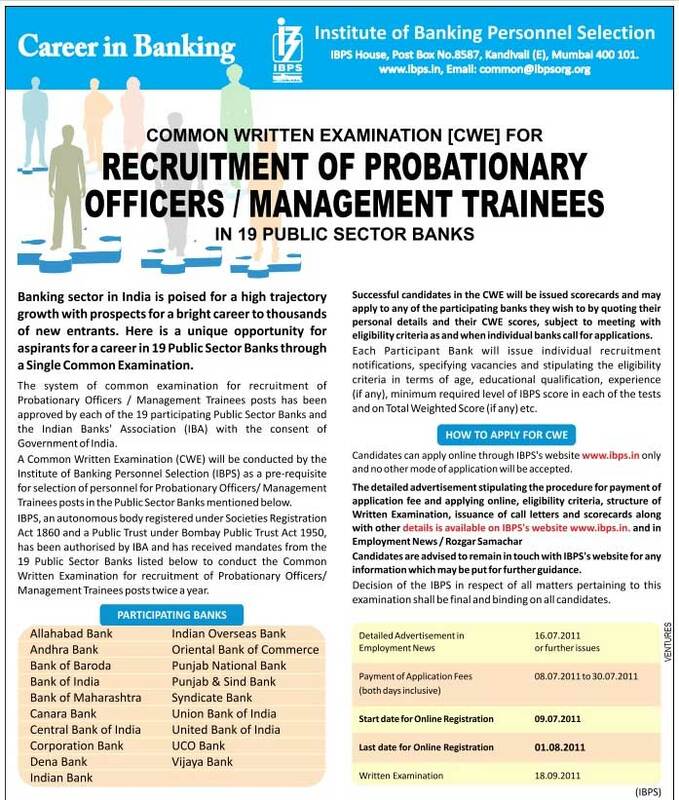 A Common Written Examination (CWE) will be conducted by the Institute of Banking Personnel Selection (IBPSJ as a pre-requisite for selection of personnel for Probationary officers/ Management Trainees posts in the Public Sector Banks mentioned below. Candidates can apply online through IBPS's website www.ibps.in only and no other mode of application will be accepted. Candidates are advised to remain in touch with IBPS's website for any information which may be put for further guidance. Decision of the IBPS in respect of all matters pertaining to this examination shall be final and binding on all candidates.